The hit that caused a stir and made Jamaal Charles see “light bulbs”. When is it enough? When will the concussion protocols of professional sports (namely the NFL) become so astringent that there won’t be the possibility for any potential debate over whether a player is healthy enough to come back into a game or play in the next one? I like Jamaal Charles. It sounds like he likes playing football. And unfortunately that might hurt him in the long run. I know several fantasy owners (myself included) that will be happy he’s playing for now. But a lot of what he said in an interview earlier this week about the hit he took last week against the Chargers and how it made him feel (he saw “light bulbs around” him) reminds me of a particular situation that has shaped my life in various ways (both positively and negatively). As a kid that developed or at least only noticed my worsening ADHD by the age of 14, I didn’t like to show weaknesses (especially when they have domineering/important parental figures that expect the best). Asking for help was worse than not knowing and accepting that hard work was needed to achieve great things wasn’t any better. Through no fault of my parents (they had their own issues to deal with at the time), I found some way to coast through till 9th grade. I can confidently tell you that there was an issue with attention by the 6th grade, but when anyone asked I was okay. I didn’t want to complicate everything else that was already confusing and fucked up. It was easier to just do my best and hope I didn’t fall too fast too quickly. I had just 3 B’s before 9th grade and whenever a grade did come close to falling, there was a panic to make sure it was contained and didn’t go beyond anything more than that. It wasn’t until my parents separated at the beginning of high school that things fell apart. That was probably the worst timing ever. Yeah, it sucked that they wouldn’t be together and that at times we would be apart from them. But the worst part about it was that I was able to use their issues as crutch for my shortcomings. Instead of admitting that I needed help and couldn’t be successful without figuring out a game-plan, I let everyone else believe that it was just some intentional act of a kid desperate for attention. Sure, that probably wasn’t completely false, but it wasn’t completely true. I needed help and if I hadn’t found it a year later I might not even be halfway to where I am now. The point is, if you go completely on gut instinct you aren’t going to end up where you want. Even if you think it’s what you need, help is never a bad thing. Who knows, maybe Jamaal Charles’ injury isn’t as bad as most are assuming, but what if it is? What if the next hit takes him out for longer or ends his career? I don’t pretend to know how many unreported concussions take place in a given NFL season, but it wouldn’t be crazy assume that it’s more than just one. 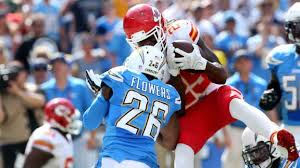 These situations are necessary for the NFL and its’ teams to understand the importance of acting in the now and taking care of their future pertaining to the various health insurance claims and lawsuits that come in result. Understand that something little that went unreported for me could have been the difference between alma maters or even going to college in the first place. For players like Jamaal Charles and other professional athletes, their entire life(line) could very well be in jeopardy.